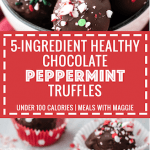 But I have to say, I am ADDICTED to these 5-ingredient healthy chocolate peppermint truffles! The recipe makes 21 truffles, so it’s enough for sharing, if you want. I made this recipe 3-4 times before I got it right and I’m not mad about it. My co-workers, husband and friends have been reaping the benefits from these bad boys. Did I mention they are healthier than a standard truffle and still satisfying? The nutritional facts are linked below, but I don’t think about calories much. I know some of you fine folks like to keep track of that, so I include it. I used Neufchâtel (lower fat than regular) cream cheese to keep the saturated fat low and richness at bay. I enjoy eating a dessert that isn’t as rich so I can have multiple! I love 5-ingredient recipes! They are easy, quick and uncomplicated. 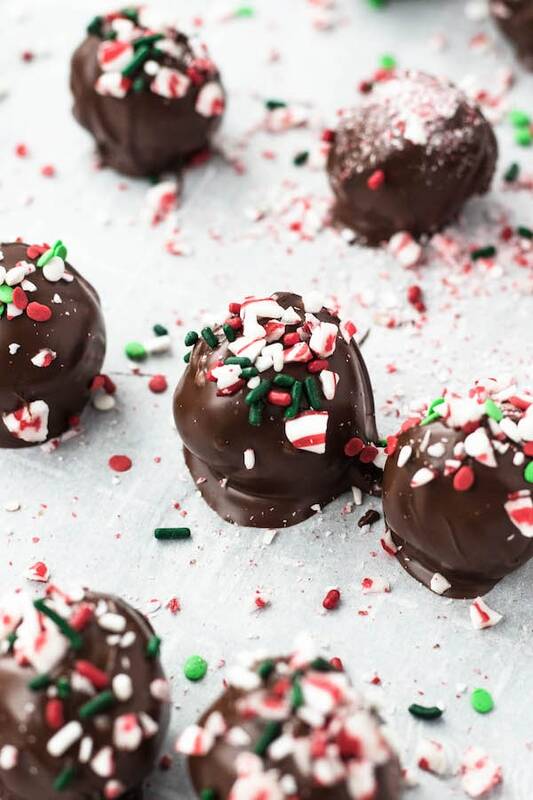 With each bite, the hard exterior shell breaks and leaves you with a soft, doughy center of chocolate pepperminty goodness. I had a fun time decorating with festive holiday sprinkles. 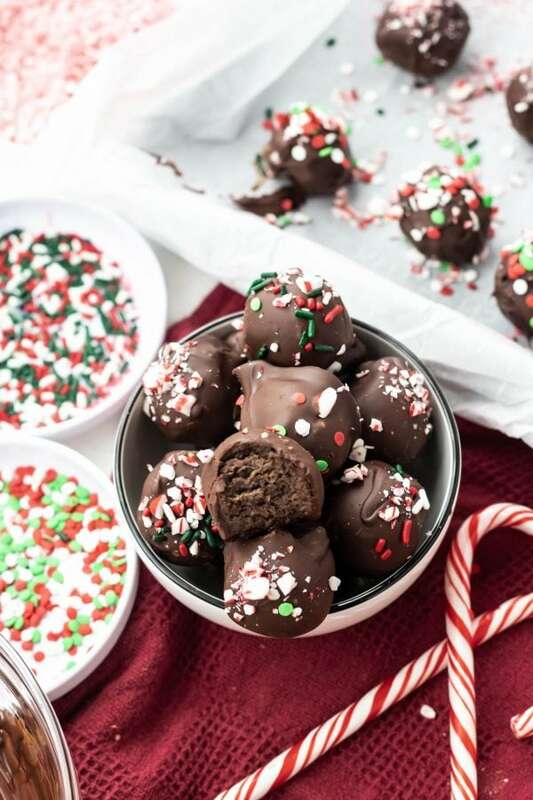 Candy canes would be a great addition, but you have to sprinkle it on right after you dip them into the chocolate sauce or else they will harden. Safe to say that I will be giving chocolate peppermint another shot next time I leave a restaurant. 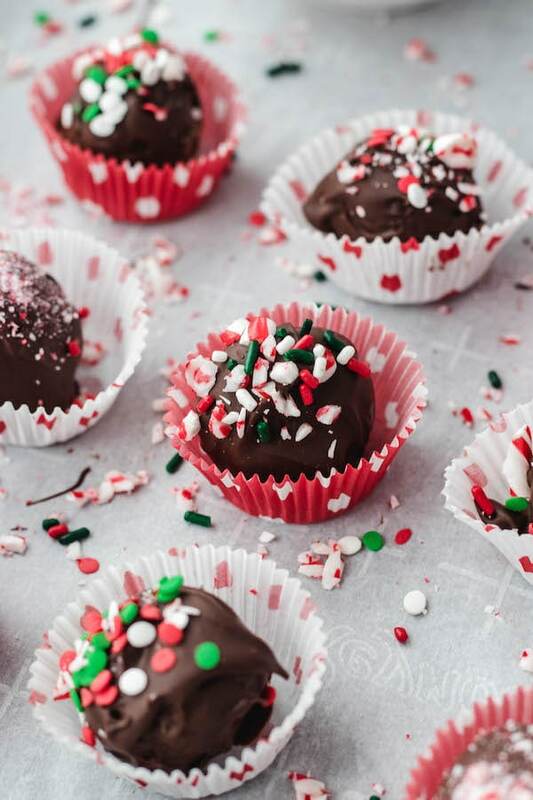 These 5-ingredient healthy chocolate peppermint truffles have shown me the light. Melt in your mouth good! 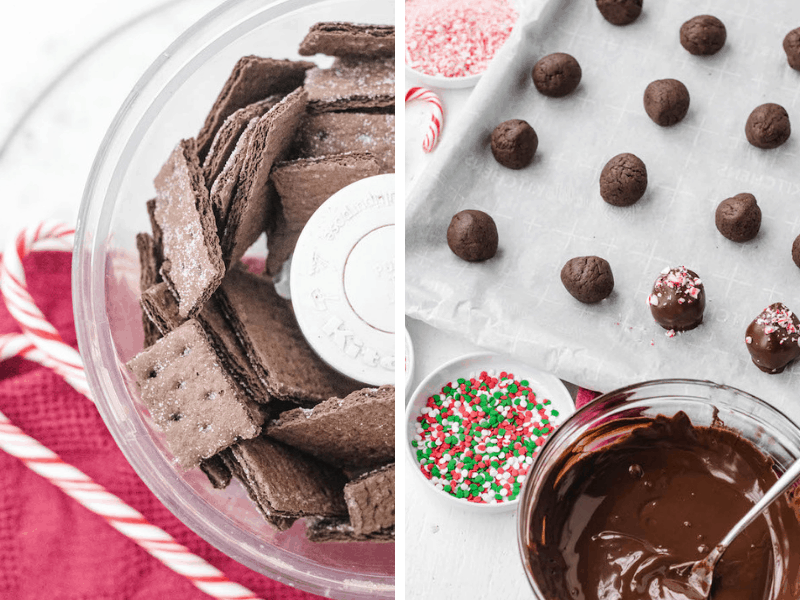 The perfect holiday party dessert. 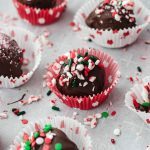 Easy to make and everyone loved them!